Can you recall that magical moment that you first held a LEGO piece in your fingers? For most people, it was the humble 2x4 block. That tiny block was your door to a whole new world of building. Limitless possibilities were in your fingers. That tiny block could be combined with many like it to create a skyscraper, or maybe a castle! You could use it to create an epic pirate ship, capable of conquering the seas. Or, perhaps you wanted to build a spaceship capable of traveling to new lands. All of that was possible with just a pile of bricks and as a kid with an imagination, that’s a powerful feeling. That’s a feeling that often gets lost in adulthood. We’re used to constrictions being placed on our lives. We’re used to having limited options. We’re used to being a told the word “no”. Long gone are those feelings of being able to take on the entire world with just a few bricks! Well, this is one costume that helps you recapture that feeling of limitless possibilities! It says “yes” to your imagination and “yes” to those old childhood dreams that you used to have! 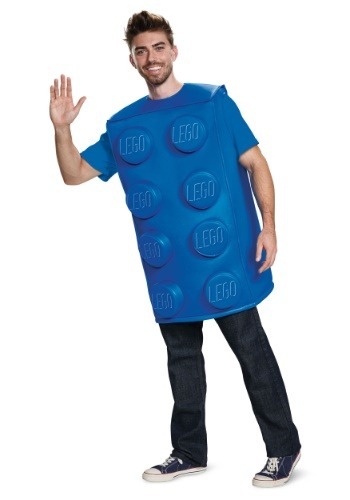 This adult LEGO brick costume is an outfit that stirs up some of your childhood memories! The costume is a blue tunic top that’s shaped to look like the iconic 2x4 block and fits over your normal clothes, so it’s a comfortable option for anyone who wants a quick and easy look. It also might make you want to build something quite grand! That’s just the power of LEGO. This LEGO costume makes for a great solo costume, but the real magic of LEGO is using a huge pile of them to really construct something magnificent! Why not try grabbing a bunch of your friends for a group costume of LEGO pieces?